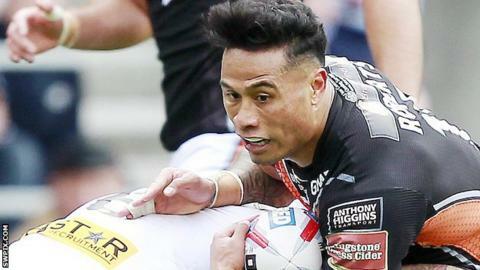 St Helens maintained their home hoodoo over Super League pacesetters Castleford, winning 26-22 despite a late Tigers fightback. Cas have not won at Saints in the league since 1990 and that run looked set to continue as the hosts led 20-8 at half-time. Regan Grace made it two tries in a row to extend St Helens' lead after Greg Eden's tries brought Cas within two. Ben Roberts sneaked in with the hooter beckoning, but the Tigers fell short. Although Cas won at St Helens in pre-season, their last competitive victory in the town came in the 1992 Regal Trophy, two seasons after their last league success, at Knowsley Road. There was much optimism surrounding their trip across the M62, given the upheaval at Saints following Keiron Cunningham's departure and, when they took an early eight-point lead, it seemed as though they might bring their jinx to a halt. However Saints scored 20 points without reply, with tries from Matty Fleming, Luke Douglas and the influential Mark Percival, who kicked five goals. The second half both began and finished in the same vein, with tries from Roberts, but Saints did enough in between to hold out and give the interim coaching team of Jamahl Lolesi, Sean Long and Derek Traynor their first win in charge. "The boys turned up and it was a short turnaround following the Good Friday game against Wigan. We found a way to win and Cas are a class team and to beat them is pleasing. "I thought we could have closed this game out a bit easier but I can't fault the boys' effort, it was unreal. "Regan [Grace] was good. He's been working really hard and has pace to burn but has a lot to learn. He's taking his chance very well and he wants to work - and that's a sign of a good player. "Every young kid thinks he's ready and we've give Regan a chance - and he's taken it." "In the first half we just got beaten for attitude and energy. We started okay but their speed at the play the ball was far superior to ours. "We defended well on our line but we made too many errors in possession. Weight of possession at Easter is always going to be crucial - and we were on the wrong end of it. "We were just not right in between our ears today. I said to the boys at half-time that we needed to keep them out if we were to go on and win - but we didn't manage to do it." St Helens: Makinson; Swift, Fleming, Percival, Grace; Fages, Smith; Amor, Lee, Walmsley, Taia, Wilkin, Thompson. Replacements: Douglas, Walker, Peyroux, Knowles. Castleford: Hardaker, Minikin, Webster, Shenton, Eden; Roberts, Gale; Lynch, McShane, Moors, Millington, McMeeken, Massey. Replacements: Holmes, Milner, Sene-Lefao, Cook.